Have a look here for an introduction to the CAL which I posted back in February which has all the details and information about yarn. So this week we begin by crocheting the first 15 rounds. This is a blanket worked from the centre so the rounds start off small and it will grow quickly this week. When we get to later weeks we’ll be doing fewer rounds because it will take much longer to crochet right around the blanket. The full written pattern is below in UK crochet terms. At the end of this blog post I’ve provided the pattern in US terms too. If you would like the pattern in a PDF format suitable for printing then here’s a link to my Ravelry where there is a small one off payment for the pattern. It’s available in both UK and US terms. Each week the Ravelry pattern will be updated, along with my blog, with the new weeks pattern. At the end of the 16 week CAL it will be 46 pages long and there are lots of step by step photos included too. I used a 5.50mm hook for my blanket but I strongly recommend that you crochet a small sample square of at least the first 4 rounds to really see which hook size will suit you best and give you results you will be happy with. This is especially important if you’ve purchased a yarn pack as I don’t want anyone to run out of yarn which could happen if your tension is much looser than mine and you don’t use a smaller hook. My sample tension square of the first 4 rounds using Aran weight (US Worsted) yarn and a 5.50mm hook measures 11cm x 11cm. My tension tends to be tighter so do use a smaller hook if needed. Many people may benefit from using a 5.00mm hook or even smaller. Abbreviations in UK Crochet Terminology. See bottom of blog post for US terms. dtr7tog: double treble 7 together: Wrap yarn around hook twice, insert hook into stitch, yarn over hook and pull through (you will now have 4 loops on the hook), yarn over hook, pull through 2 loops, yarn over hook again and pull though 2 loops (you will now have 2 loops on the hook), repeat from the start 6 more times (each time you will gain an extra loop), at the end you will have 8 loops on the hook, yarn over hook and pull through all the loops on the hook. Just like the sea tides that turn, this blanket is worked by turning at the end of each round. This ensures that the square is kept as straight as possible. The starting chains count as the first stitch throughout the pattern, even on the dc rounds. It may help to put a stitch marker into the starting chains at the beginning of each round making it easier to identify the correct place to insert your hook into at the end of the round. Using Yarn A, make 4ch, ss to first ch to join into a ring. Half Treble stitches are unique in that they have 3 strands at the top of the stitch. 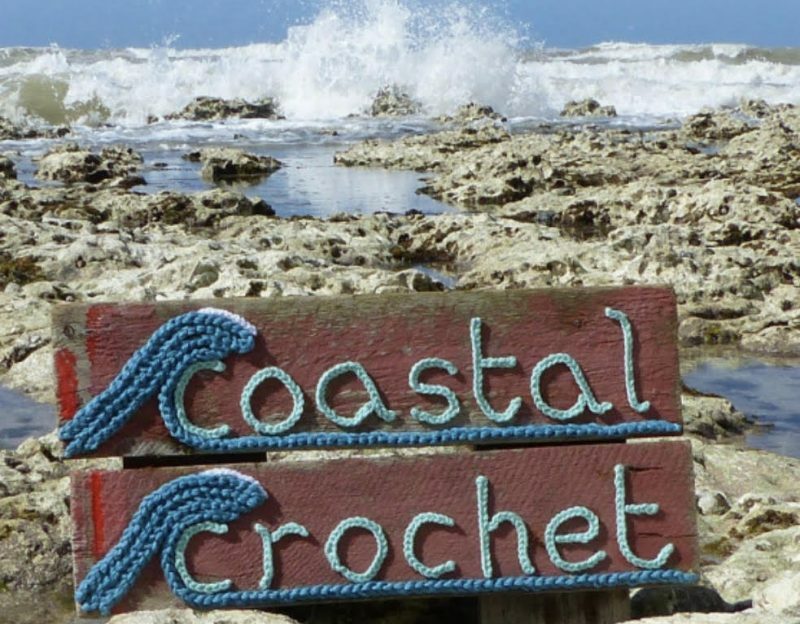 Make sure that in Round 5 you are inserting your hook into the top 2 strands as normal, leaving a front strand/loop to the front of the work which will be crocheted into on Round 6. Round 6 With RS of work facing, join Yarn C to front loop of any htr st from Round 4 inserting hook from the bottom, 2ch, 2htr in same place, 1ss in next front loop, continue with (3htr in next front loop, 1ss in next front loop) all around on each side, ss to top of first 2 ch, fasten off and weave in ends. …it does use a lot of yarn! I live close to beaches filled with grey pebbles, some of which are really quite large. And it always amazes me how the power of the sea can shift tons of these pebbles across the beach. After a storm or particularly high tide, the pebbles can be swept away by the sea to reveal sand. And then in the next tides, the pebbles are put back! tr7tog: treble 7 together: Wrap yarn around hook twice, insert hook into stitch, yarn over hook and pull through (you will now have 4 loops on the hook), yarn over hook, pull through 2 loops, yarn over hook again and pull though 2 loops (you will now have 2 loops on the hook), repeat from the start 6 more times (each time you will gain an extra loop), at the end you will have 8 loops on the hook, yarn over hook and pull through all the loops on the hook. Just like the sea tides that turn, this blanket is worked by turning at the end of each round. This ensures that the square is kept as straight as possible. The starting chains count as the first stitch throughout the pattern, even on the sc rounds. It may help to put a stitch marker into the starting chains at the beginning of each round making it easier to identify the correct place to insert your hook into at the end of the round. Using Yarn A, make 4ch, sl st to first ch to join into a ring. Round 6 With RS of work facing, join Yarn C to front loop of any hdc st from Round 4 inserting hook from the bottom, 2ch, 2hdc in same place, 1sl st in next front loop, continue with (3hdc in next front loop, 1sl st in next front loop) all around on each side, sl st to top of first 2 ch, fasten off and weave in ends. Yaaaaaay! I can’t wait to make a start when I get home! I shall be happily watching progress! Great colours so far! Hi. Do you have a picture of the completed blanket? I hesitate to invest in the yarn if it is not what I want to crochet. I am on a very limited budget. Also I use Safari on my iPad and when I save patterns on it there is an option to save my patterns without all the ads and comments so it can be printed. However, all the emojis become very large and take up one whole page just by themselves. Would you consider in the future not putting in the emojis? My friends who I crochet with have the same problem. My kit on its way from Knitting Network….can’t wait to get started! Hopefully comes soon to US. Yes, I was one of the people in the US that knitting network decided they would not ship to die to cost. Why not tell me what the extra cost would be and then give me the option of whether I still wanted to purchase the kit or not? I am very unhappy with how this was handled. Now I will have to purchase my yarn from somewhere else and will be behind on the CAL. I love that little fish stitch marker. I have a question – if the starting chains count as a stitch, on Round 2 should the first instruction be 1tr, ch2, 2tr into the chain space? Is it next week yet?? Can’t wait for next set of instructions! ummm mine is two cms larger, will I really run out if I continue do your think? The only colour we’re tight on towards the end is the yellow… you could always just get an extra ball if needed or substitute it with another colour you have left… so I wouldn’t worry… carry on!! Love this blanket and will try to work it into my long list of ongoing WIPS! I’ve seen the link to this pattern on Ravelry, but am wondering if you have this CAL in one of the groups there. I did a quick search and didn’t find one. I have your blog bookmarked on my iPad, but Ravelry is my go-to for following CALs. Thank you thank you thank you! Loving learning new things and you are making it so easy to follow. Going rogue with xmas colours but still looking good! Also using random colours and your excellent pattern lends itself to them. So pleased. Thank you for spending so much of your free time creating this wonderful project it’s so generous of you. It’s much appreciated by myself and my daughter Louise. I’ve just finished rounds 1-15 using cream, pale green and shades of pink. The pebble stitches are new to me and look amazing. Love this pattern – I’m really looking forward to the next installment!